Mobile Connect provides smartphone, tablet and laptop users with simple, policy-enforced, network-level access to corporate and academic resources over encrypted SSL VPN connections. 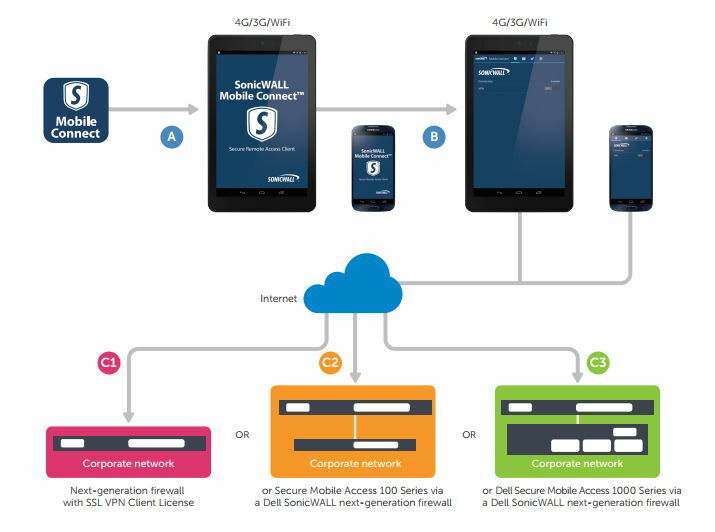 Dell SonicWALL enables users to centrally create and manage remote access policies in order to achieve real-time monitoring, log and analyse access activity and deliver intuitive reports. With Connect Client, IT-managed and unmanaged PCs and laptops can securely access key business applications and enjoy an “in-office” experience via the Dell SonicWALL WorkPlace portal. Because there is no pre-installation or pre-configuration required, authorised remote workers can sit down at any computer with internet access to securely plug into your network. Establish security policies that continually detect the identity and security state of end devices. Provides transparent, dynamic deployment of appropriate access methods that are based on user authentication, endpoint security or zone classification and resource. Secure Virtual Assist allows a technician to assume control of a customer’s PC or laptop to provide assistance, while remote professionals can also connect to their PC to stay productive. A unique one-time password can be generated for every log in and combined with the username and standard network password for enhanced log on protection.